Public Workshop To Help Grow Citizen Scientists To Measure Impact Of Green Infrastructure. What do you do when you don’t have the staff to measure the impact of or maintain green infrastructure projects that your department has installed and distributed in a decentralized fashion throughout a city? 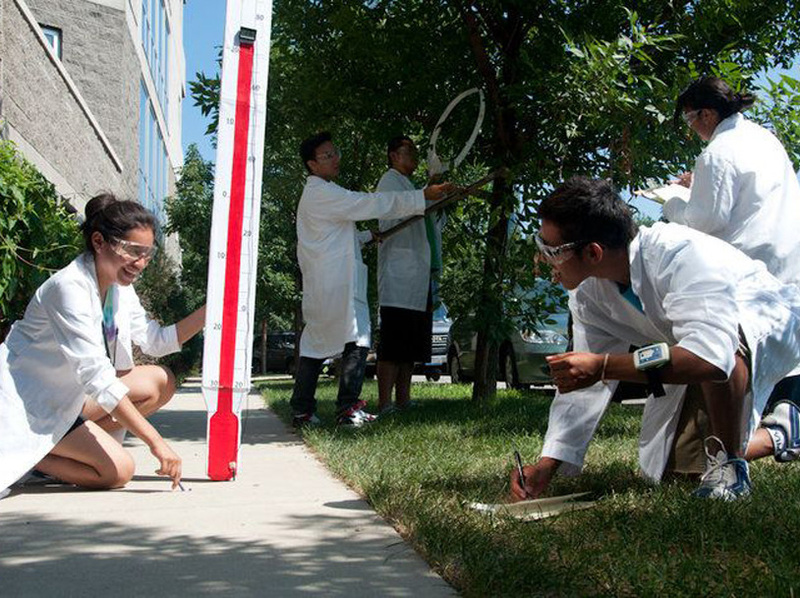 ‘How about growing a corps of citizen scientists? Given our work helping create Shadelab, it’s probably not surprising that we think it’s a great idea. What if these citizen scientists were also trained as green community design leaders, able to explain the importance of and advocate for these often relatively hidden projects within the context of the design of their neighborhood? First of all, our hearty congratulations to Franco Montalto, a civil engineer, hydrologist, and professor at Drexel University in Philadelphia for receiving his Career Grant from the National Science Foundation this spring to investigate, ‘Integrated Assessments of the Impacts of Decentralized Land Use and Water Management Practices in Urban Ecosystems’. Needless to say, we are pleased as punch that Franco ‘won’ and that last summer, in the midst of assembling his proposal, he asked Public Workshop to be a part of his team for this important project. Over the next couple of years, we will be working with Franco; other team members at GrowNYC and Drexel University; and in communities in New York and Philadelphia to design a curriculum and advise on the creation of a prototype program for growing citizen scientists to measure the impact of distributed green infrastructure projects. We think there is huge opportunity embedded within this project for social and civic innovation, as well as completely redefining the ‘classroom’ and STEM/STEAM education. While work on the project is yet to begin, the curriculum will merge elements of ecology, urban design, technology, and community leadership training, and may evolve into a certificate program. To be sure, the decentralized nature of these green infrastructure improvements that necessitate looking outside of traditional organizational structures for solutions and thus allows for tremendous opportunities for civic and social innovation, will also present unique challenges. In short, realizing the full opportunities for civic and social innovation will require that the citizen scientists feel like they are part of something special and of a group of people doing truly important work—this is hard to do across the expanse of a city or region, and seemingly disconnected projects and people. For these very same reasons, in our opinion, outside of committed or topically connected groups such as the lovers of a particular type of migratory bird, the promise of most crowd-sourced research projects has rarely been realized. How many bioswale fan clubs have you encountered? Of course this is part of the unique problem that green infrastructure improvements face, an essential point of the project, and one of the reasons why Franco’s project is so important. How is Franco’s project different and why are we going to succeed? The concerted educational component is a key difference; we have some tricks up our sleeves; and are quite excited to work with such accomplished partners to tackle this unique challenge that has such important implications for the future of our cities and schools.